Walnut Wine Case with removable, sliding top. Holds a Burgundy or Bordeaux size wine bottle; does not accommodate a champagne size bottle. Laser engravable. Beautifully crafted chest for safe-keeping of family heirlooms, jewelry or special memorabilia. Changeable top and front photo frames come with plexi glass inserts. Overall size: 11x13x8 – top lifts to expose a 2” deep tray – the front panel is removable to allow access to 2 drawers below top tray – the drawers have dividers to keep items separated and safe – all interior space is felt lined – brass side handles and front latch complete this distinctive keepsake box. 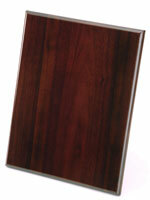 Available in satin rosewood or brown oak finish. “Piano Finish” Plaques are laser-ready. Our high gloss walnut plaques are hand selected to ensure minimal contrast in color and grain pattern across the face of the plaque. Piano finish plaques have square corners and radius edge. Beautifully crafted solid wood case with brown mahogany finish and glass side panels. Gold tone pillars with revolving gold tone pendulum.